They’re “mine” in the sense that a relationship binds us, a precious relationship. But they’re not “mine” in the sense that… I own them. Control them. Shape them. Do you know this about your children? That you don’t own them? That you don’t, in fact, create them? If you have teeny, teeny children, you might not know this yet. You may still be devouring parenting books and philosophies. You may be in love with Dr. Sears’ attachment parenting philosophies because you think that doing the AP things will make your children a particular way… You may think that they are yours. Those of us blessed with a strong-willed, challenging child as our first-born learn this unlesson very very quickly. Mine to create, shape, control? Ha. By the time Cinder was 15 months old, I knew this was not the case. Flora, more accommodating and eager to please, may kept me deluded longer. But she too is of me—but not mine. Her own. Completely her own. Ender, I knew was his own before he came out of my belly. It’s so hard to realize this because… well, they come of us. And for birthing mothers, out of us. For all parents, adoptive, foster, birth: we are so responsible for them. For keeping them alive. We create their environment—their opportunities—and their obstacles and challenges. We make their lives… easier or more difficult. And we love them, gods, we love them so desperately. Ender sleeps. I watch over him while his fever burns, comes down. Love him. Accept that while I am ever-so responsible for him… he’s not mine. But his own. I don’t own him. He is my trust. My responsibility. In my care. But ultimately, he belongs–to himself. To the world. Not to me. Terrifying. But also… freeing. Don’t you think? Like this? Then check Mommy, for Real’s Mommy’s Law. Shorthand summary: if parenthood was a job, it would have “control freaks need not apply” in the wanted ad. And thank you to Katia at I Am The Milk for the kind words about NBTB’s They Tell You It Gets Easier. They Lie post, as well as Camilla and Louise at The Best of Two Sisters for referencing “Please don’t give my daughter an eating disorder. But you will. You will” in their Are we harming our girls? post earlier this week. NBTB’s eating disorder post is also flagged by the thoughtful Thalia Kehoe Rowden at Sacraparental, in (Hopefully Not) passing on body hatred–thank you, all, for continuing the fight to save our daughters. Oh. Of course, you want to know how did my writing retreat go? Ever so well. Stay tuned. 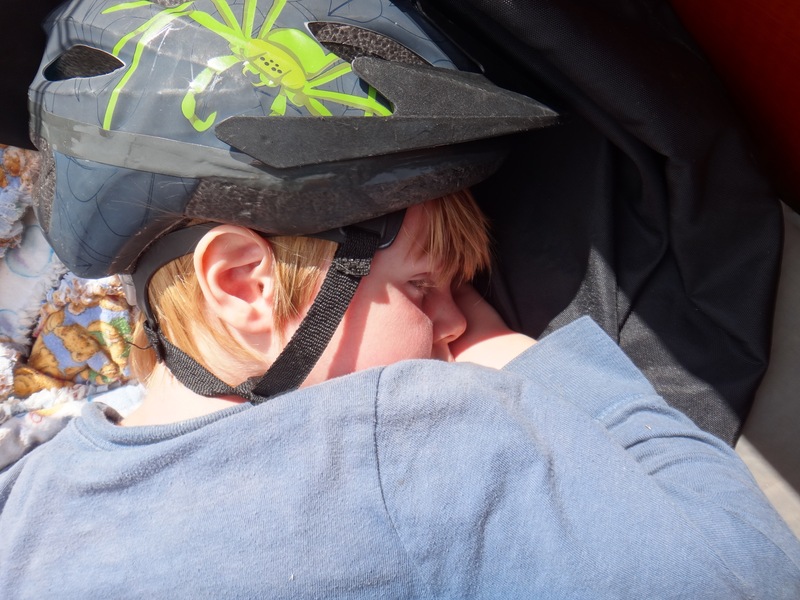 Photo: Feverish Ender asleep in our cargo bike. Ooh, this is very exciting! Thanks very much for the kind words! And yes, I agree about the disconcerting not-mine-ness of children. At a few months old, SBJ was already very unlike us in clear ways (cheerful upon waking, for one! ), which underscored that he was his own person. I find it both terrifying and liberating to think that I am nurturing and guiding a child to become who he is, rather than forming him to become who I want him to be. I, too, learned this lesson very early on with Emma, who, was also very strong willed pretty much from the get-go as well. Lily was bit more even-tempered, but as she is getting a bit older is also more headstrong. Thank you for sharing and hope Ender is feeling better!! “Your children are not your children. They are the sons and daughters of life’s longing for itself. They come through you, but not from you. I think that I am still learning this. I am terrified of the world for my son without me and continually mentally kill myself off in horrible accidents and then wonder who will help him to navigate this strange, beautiful and more confusing for him (autism) world. I’m trying though. This was a beautiful awesome post. Thought-provoking post and an important point that our children do not belong to us. I think so many parents are so invested in their child’s every move because they can’t separate themselves from their offspring. It’s not that we want to control them, but we see them as a reflection of ourselves and don’t want them to let us down, which leads to controlling type behavior. A good reminder that we need to see our children as their own individual personalities. I’m starting to understand this as my two year old gets older. He has such a distinct personality — so different than mine, yet I can hear echoes of myself in what he says and does. It’s not that they cannot be *like* us. They are part us, after all. 50 per cent us… They’re just not… ours. My oldest son mirrors Cinder’s behavior and my second born daughter behaves more like Flora. Odd. We’re hoping to have a third…are you telling me we’ll be in for a wild ride? More importantly, I do agree with you. There are things I see my children doing on a daily basis that make me realize they are creating themselves just as I am helping to raise them. This reminds me of a proud moment I had the other day. My (uh, I mean, “the”) 4yo feeds the cats. We keep the food in a plastic bin. The label has a picture of a dog and says “Pet Food Container” or something like that. When he first started feeding the girls, he questioned the container because of the picture of the dog. I told him that we could put whatever we wanted in it. Months later, he’s now reading. He came to me the other day, and told me we couldn’t use that bin “because it says ‘pet.’ We don’t have pets.” I love that even at his age, he knows that living creatures can’t own each other. I also thought of the Kahlil Gibran poem while reading this, one of my favorites. I have two grown up kids, and I will say that it was a hard lesson to learn- letting go. There is so much emphasis placed on the early years, but I found the teenage years were when I could have really used some wisdom. I love hearing that from mothers of teenagers. Part of letting them go is seeing their uniqueness, seeing them as individuals. You clearly do. I really loved hearing how all of your children are different. They have a mama with loving eyes! It’s like you are reading my mind. The last week I have been watching Isaiah… he is definitely strong willed and challenging, but he is so special, so unique, I see him in this moment and my heart breaks, because I know he is not mine. Not how I want him to be. Forever mine… I am not at the freeing part yet. Maybe someday. Yes they are their own little people and we have to help them along the way in this world. They are them.